Style meets comfort in the elegant Brushed Steel Breakfast Bar Stool Green, a modern piece that brings a fresh splash of colour to your interior. 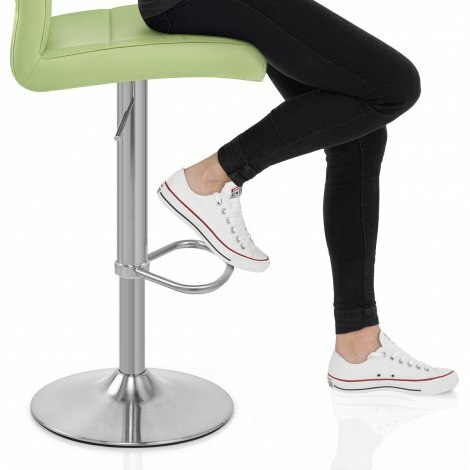 The Breakfast Bar Stool is a classic model with a cool contemporary twist that delivers effortless panache. Carefully crafted to provide excellent levels of support, the seat is ergonomically shaped and filled with high-density foam padding. Contemporary green faux leather and horizontal stitching combine to form a sophisticated seat finish. The seat is complimented by the brushed steel of the one-column frame. 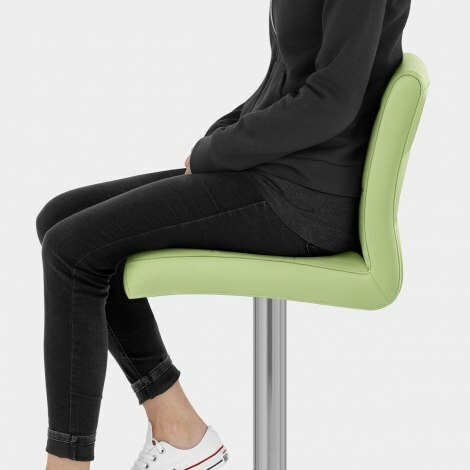 For practicality, the frame features an integrated gas-lift for variable height and 360-degree rotation, as well as a supportive triangular footrest. The round base is also brushed, and features a rubber floor guard to help to reduce friction between your stool and floors. "Well padded and very comfortable"
Very pleased with my new stools, arrived on time and well packaged.The assembly instructions could be a bit clearer but a quick phone call to a very helpful lady at the company easily rectified that. She new exactly what to do and made it so easy for me. Very happy with the bar stools. Arrived the next day and I was texted with a time slot for delivery. Great colour and so easy to put together. Well padded and very comfortable.